With citrus fruits being in prime season at the moment I could resist grabbing a few of the delicious and bright "Cara Cara" oranges at the grocery store. I've also been stocking up on lemons for detoxing with hot water; so with plenty of citrus lying around the house I decided to whip up a cocktail the over the weekend. This one is perfect for brunch and can be made with or without alcohol! It's tangy, bubbly, and super refreshing. The Rosemary garnish adds a sweet touch as well. 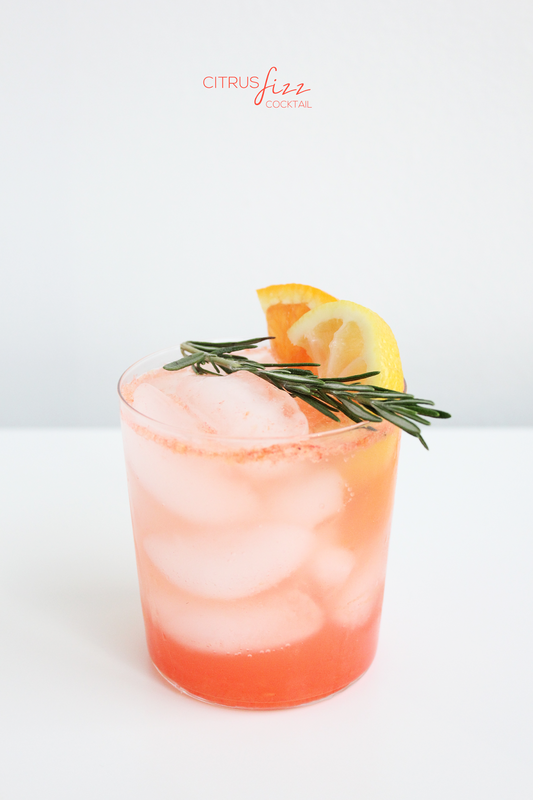 Have you been making any citrus based cocktails this winter? What drink are you loving at the moment? *If you can also add a bit of simple syrup to the drink if you want to sweeten it up a bit. Regular simple syrup or Rosemary infused simple syrup works really nicely. This drink looks delicious! It helps that I am a fan girl of some Gin! I might need to mix one of these up sometime soon. ;) I actually just had a fantastic salad the other day topped with grapefruit. Not a favorite citrus choice of mine, but was fantastic paired on this mix of greens! That sounds like an awesome salad topping. I love grapefruit but rarely snag it at the store. Thanks for the inspiration! This drink ... can you make me one? Sounds amazing + makes me want summer! Looks so refreshing :) Good job! This looks and sounds so refreshing! Now I want one!! It is super refreshing and very light! The citrus isn't overwhelming and it's just enough flavor! You should totally make the rosemary infused simple syrup then! I feel like you would love how that pairs with the drink!